Heat oven to 400°F. 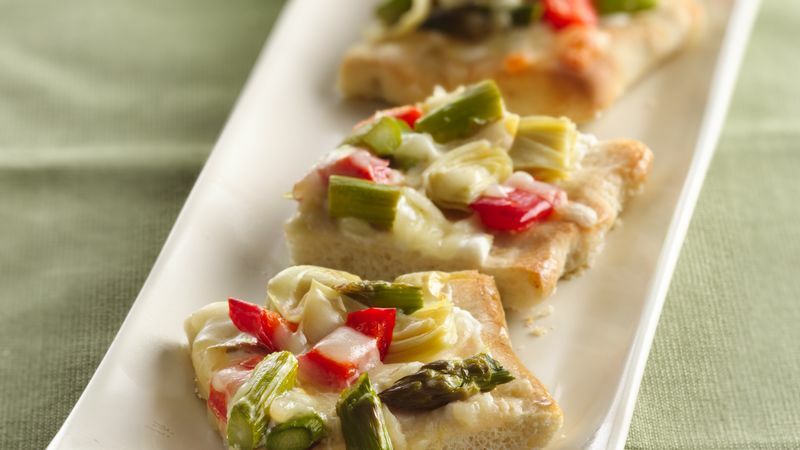 Place asparagus and red pepper in ungreased 13x9-inch pan; drizzle with olive oil and sprinkle with sea salt. Bake vegetables 12 to 16 minutes or until crisp-tender, turning once halfway through baking. Cool 5 minutes. Meanwhile, spray cookie sheet with Crisco® Original No-Stick Cooking Spray. Sprinkle with bread crumbs. Unroll pizza crust dough onto crumb-coated sheet; press into 15x10-inch rectangle. Flute edges of dough. Bake 12 to 16 minutes or until crust is golden brown. Cool 5 minutes. Meanwhile, cut asparagus and red pepper into 1/2-inch pieces. Spread cream cheese onto warm crust; sprinkle with lemon peel. Arrange half of the artichokes, asparagus and red pepper over cream cheese; sprinkle with half of the Swiss and Gruyère cheeses. Repeat with remaining vegetables and cheeses. Bake 8 to 10 minutes or until edges are golden brown and cheese is melted. Remove from oven; sprinkle with garlic powder.